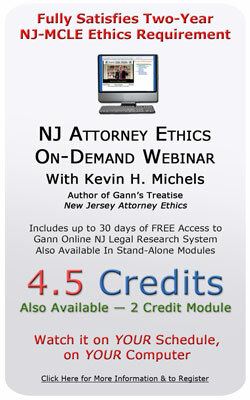 In this 3.5+ hour webinar, Professor Michels offers a comprehensive overview of the unique attorney ethics system in New Jersey. He begins by describing the disciplinary system by which the Supreme Court exercises its constitutional jurisdiction over the practice of law in this State. Through specific hypotheticals, Professor Michels elucidates the ethical considerations relevant to establishing and maintaining an effective client relationship, including potential conflicts of interest and confidentiality concerns. He goes on to consider fee arrangements, billing and collections in the ethics context. Finally, again through hypothetical real-life situations, he considers disclosure requirements and representation questions in the corporate setting. During each segment of the video presentation, hyper-links are provided to connect you immediately to the primary and secondary authorities cited. Who must comply with the continuing legal education requirement? Please email cle@gannlaw.com for additional assistance. "I was expecting this webinar to be dry and boring, but I was pleasantly surprised at how interesting it was and how quickly it moved along. Well Done!" "The links helped me to explore more in depth the topics discussed. It explained the nuances of tricky ethical concepts." "Very informative. The ability to pause and come back to things made it feasible to do it during the work day and still get things done." "Professor Michels obviously knows the subject cold and has very good presentation skills." "It makes one wonder why there is a live requirement when there is material like this available." "It was easy and excellent. I have been practicing for 19 years and, many times, was able to apply the issues discussed to my own cases." "The convenience of being able to watch at my own pace was very helpful in today's busy world." New Jersey Attorney Ethics: This program had been approved by the Board on Continuing Legal Education of the Supreme Court of New Jersey for 4.5 hours of total CLE credit. Of these, 4.5 qualify as hours of credit for ethics/professionalism, and 0 qualify as hours of credit toward certification in civil trial law, criminal trial law, workers compensation law and/or matrimonial law. New Jersey Attorney Ethics (Module 1): This program had been approved by the Board on Continuing Legal Education of the Supreme Court of New Jersey for 2 hours of total CLE credit. Of these, 2 qualify as hours of credit for ethics/professionalism, and 0 qualify as hours of credit toward certification in civil trial law, criminal trial law, workers compensation law and/or matrimonial law. New Jersey Attorney Ethics (Module 2): This program had been approved by the Board on Continuing Legal Education of the Supreme Court of New Jersey for 2.5 hours of total CLE credit. Of these, 2.5 qualify as hours of credit for ethics/professionalism, and 0 qualify as hours of credit toward certification in civil trial law, criminal trial law, workers compensation law and/or matrimonial law.